Al-Aqsa TV Channel said that the Israeli military order to ban al-Aqsa TV work in Jerusalem and the West Bank will not obstruct its coverage of events in those areas. 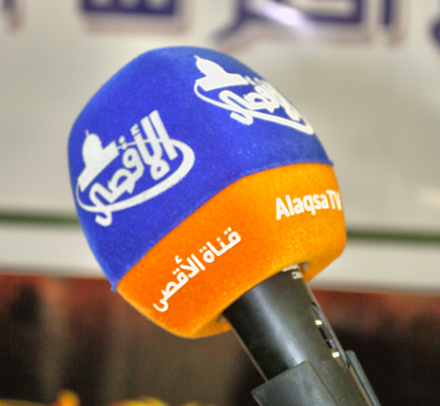 Director of the News Department at al-Aqsa TV told Quds Press on Thursday that “the channel has been subjected to suppressive practices either by detention of media staff or by striking its headquarters since its establishment in 2006. More than 28 cases of arrest and summonses by Palestinian Security Forces and 8 cases of detention by Israeli Occupation Forces (IOF) have been reported”. He pointed out that the Israeli ban indicates the impact of al-Aqsa TV Channel on directing the Palestinian public opinion as well as the Israeli. The Israelis themselves depended on al-Aqsa TV for seeking true news during last summer’s Israeli aggression on Gaza, he said. “The Israeli ban aims at controlling our work which will not come true. We challenge this decision and will work by our own methods”, the Director said. The Israeli occupation authority had issued a military decision to ban al-Aqsa TV Channel from working in the occupied Jerusalem and West Bank, claiming it had links with Hamas Movement. The Palestinian Journalist Syndicate (PJS), on Wednesday, slammed Israel’s arrest of Ala’a al-Titi. Meanwhile, Facebook has removed the page of a Hamas-affiliated news agency. A protest in solidarity with al-Titi was held in front of Ofer prison, in Israel, according to WAFA correspondence. 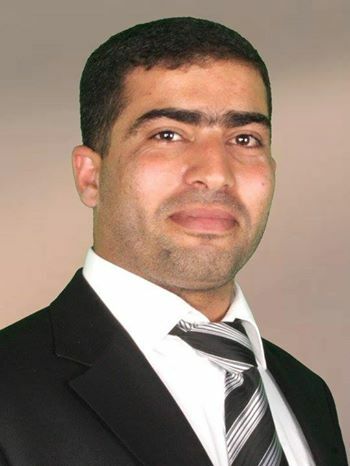 Secretary General of PJS, Abdul Nasser al-Najjar, condemned the detention of al-Titi almost a month ago, expressing total rejection to the policy of arresting journalists on grounds of their work. He stressed that Palestinian satellite channels work in line with regulations and laws, and that reporters have a right to practice their job inside the Palestinian territories. Al-Titi was arrested three times, including the current arrest, under grounds of working for what the Israeli authorities described as a ‘terrorist satellite channel’ (Al Aqsa). He was arrested on January 21, after Israeli forces brutally raided his home in Aroub refugee camp, to the north of Hebron, according to the Palestinian Information Center. The center said that Titi’s arrest came only a week after his release from PA jails, where he was detained several times by PA security forces, in addition to spending four years behind Israeli bars. The Palestinian Authority continues to work in close coordination with Israel, in regard to "security" issues, despite PA President Mahmoud Abbas' threats to dismantle the union. Head of PJS called upon international and Arab journalist unions to dispatch a letter to the Israeli government, requesting the release of 15 Palestinian journalists currently being detained in Israeli jails. 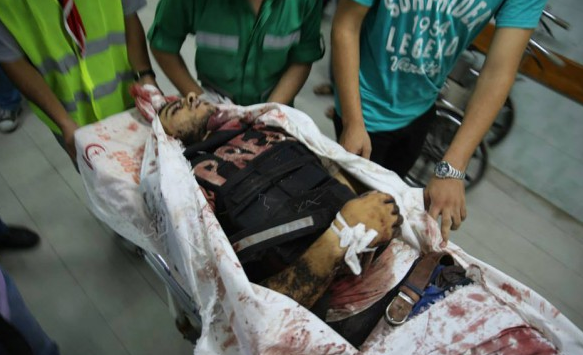 To be noted, Around 17 journalists were killed and 30 others were wounded during the third Israeli offensive on Gaza in just seven years. Houses of other journalists were also demolished, displacing their families, while several media outlets were targeted and destroyed. In a related vein, WAFA further reports that the online social networking website "Facebook" has removed the page of the Hamas-affiliated Shehab news agency, after its followers had reached about 2.5 million users. Followers of the page have reported their inability to view its content. Shehab is one of the widely spread social networking groups in the Palestinian territories, and reports daily on news related to the West Bank and Gaza. Facebook administration cited "graphic violence" as the reason behind deleting the page. There have been several moves by Facebook against Palestinian-run pages, citing hate and violence pretexts, although Shehab is hardly central to the vicious political dialog found on many Facebook pages. In March of 2011, Facebook removed a group run by Palestinian activists calling for a third Palestinian uprising. According to Israeli media, then Minister of Diplomacy and Diaspora Affairs, Yuli Edelstein, sent a letter to Facebook founder Mark Zuckerberg, demanding that the page be shut down immediately. The page was later removed, after it had gathered over a million participants. Up until then, the founders of the group, which was created in the heat of the widely publicized "Arab Spring" revolutions, said that they got the idea for that page from these uprisings, which eventually toppled Tunisia’s Zine El Abidine Ben Ali and Egypt’s Hosni Mubarak. Ministry: Israel's claims on journalists slain in its war "misleading"
The Palestinian ministry of information strongly denounced Israel's channel 7 for fabricating claims about some of the journalists that had been killed by the Israeli army during the last war on the Gaza Strip, and described its report as "misleading." Israel's channel 7 claimed in a recent report that eight of the journalists who were killed during Israel's last military operation in Gaza were working for Hamas and Islamic Jihad. The information ministry said in a press release on Sunday that the channel's claims about the journalists was an exposed attempt by the Israeli government to shirk its responsibility for the crimes its army had committed against the journalists in Gaza. 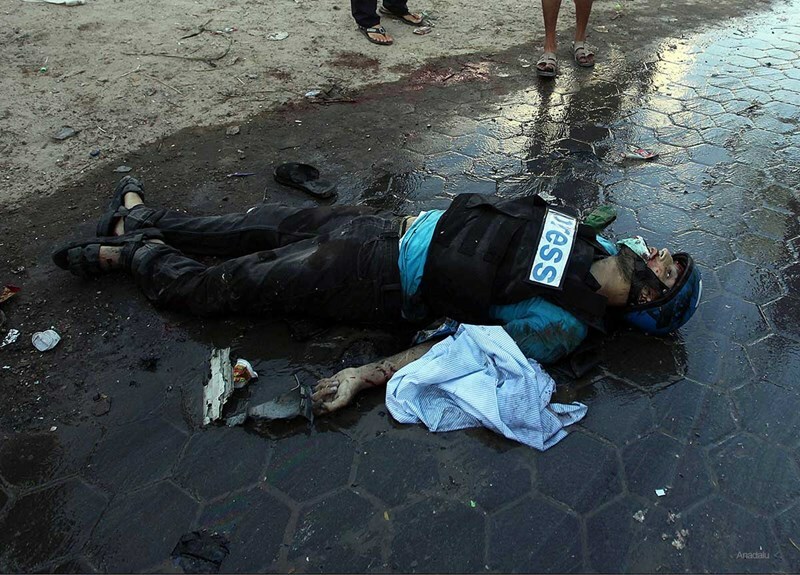 The ministry underlined that all Israeli crimes against the journalists in the last war were documented in reports issued by international and local organizations, especially the International Federation of Journalists. It said that Israel's attempt to deflect attention from its crimes by questioning the number of slain journalists and their professional activities could not deceive the UN probe committee or the international community. 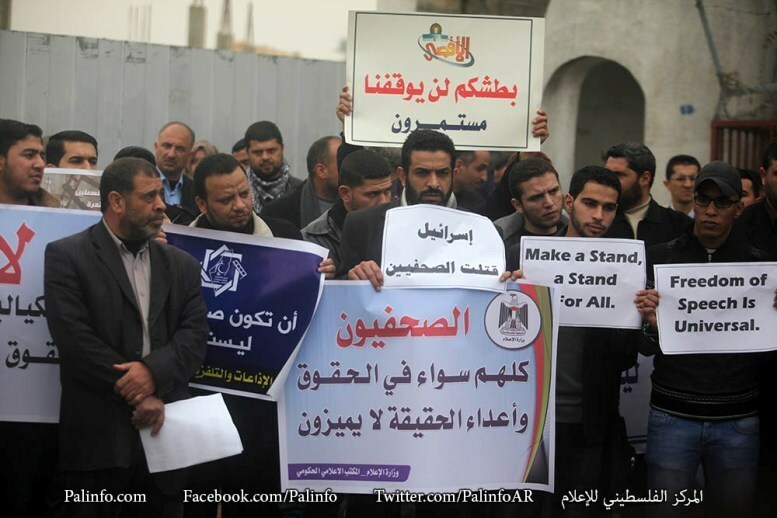 Palestinian Journalists Syndicate in Gaza Strip has organized on Sunday a protest sit-in outside Al-Aqsa TV channel’s headquarters in support of its reporter Alaa al-Titi who is still detained in Israeli jails. Several national figures and media institutions including the Palestinian Information Center (PIC) participated in the solidarity sit-in. The participants demanded an end to the Israeli policy of repression against West Bank journalists, calling for the immediate release of all Palestinian journalists held illegally behind Israeli bars. They (the Palestinian journalists) will never give up; they will always continue their important mission. You have destroyed our media institutions and killed our journalists, but more powerful voices emerged and sprang up in this land, Bardawil said addressing the Israelis. The Union of Palestinian Radio and Television has earlier confirmed in a statement issued Saturday that 15 Palestinian journalists are currently held in Israeli jails. Palestinian journalists taking Hebrew language course at Ramallah college in bid to better cover conflict, read Israeli newspapers, communicate with IDF soldiers. "As the saying goes: Know the language of your enemy," says Dalal Said, a Palestinian television reporter who is learning Hebrew in a bid to better cover the conflict. She is one of about 30 journalists taking two hours of Hebrew classes a week at a college in the West Bank city of Ramallah with an emphasis on learning to read Israeli newspapers. "We live under occupation so it is crucial that we know what the press says to be able to get the bigger picture," says fellow student Imad Freikh, who works for a weekly magazine. For Arabic speakers, learning Hebrew can be surprisingly easy because both are Semitic languages and often have similar three-letter roots for a word. Although Arabic script is cursive and Hebrew is written in block letters, both are constructed predominantly of consonants with some or all of the vowels omitted. During the six-week course at Nasser al-Shiukhi college, the teacher – a Palestinian from Jerusalem who has a degree in Hebrew – tries to add some context to his lessons. While teaching the colours, he tells his students that the word for black is "shakhor", making sure to add that some Israelis refer to black people as "cushim" - a derogatory term which he says demonstrates a tendency toward racism. Talking to soldiersFor Ali Obeidat, a journalist who helped organise the course, knowing Hebrew is crucial to access information not always readily available in Arabic. "In some cases, there is no Palestinian source for certain information so the Israeli press is the main source for covering the conflict," he told AFP. This is often the case when it comes to the number of people injured in a clash with the army or Jewish settlers where Israeli medics are often first on the scene and the only ones with accurate information. Very few Palestinian journalists have official accreditation to cover events in Israel, giving them little access to direct quotes from Israeli officials, so they often pick up such remarks from the Israeli or international press. Knowing Hebrew is also crucial to be able to communicate with Israeli soldiers, whose presence is ubiquitous across more than 60 percent of the occupied West Bank. Speaking the language is particularly important for Palestinian journalists working in the field, especially when they are in a dangerous situation, says Nasser al-Shiuki, head of the college which runs the course and has already trained around 200 journalists. "It is vital for Palestinian journalists, above all for photographers and cameramen who cover clashes all the time and are in direct contact with the Israeli army," he says. "If you understand the language of your enemy, you know how to interact with him." Widespread exposure Many Palestinians already speak some Hebrew because until the start of the second uprising, or intifada (2000-2005), roughly 150,000 of them had jobs working inside Israel. When the violence erupted, Israel cancelled their work permits. Countless thousands of others have also learned some Hebrew through years spent inside Israeli prisons where it was the only language with which they could communicate with their jailers. In annexed east Jerusalem, which is home to 310,000 Palestinians, most speak Hebrew by necessity although their grasp of the language is far from that of Israel's Arab citizens, who make up around a fifth of the population. Living, working and studying in the Jewish state, they have a far greater level of fluency in Hebrew, giving them greater access to an array of jobs, including the legal profession where they often represent their Palestinian brethren in both civilian and military courts. 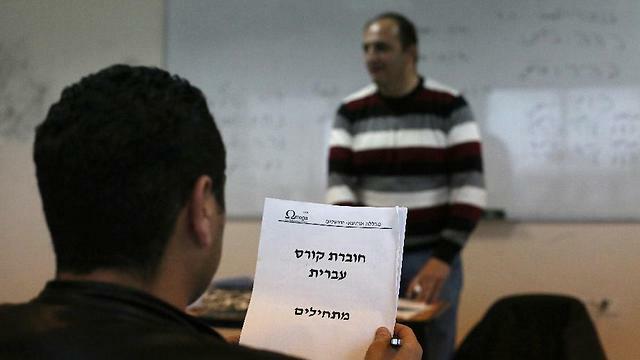 Most Israelis meanwhile learn some Arabic at school because it is one of the country's official languages. For Said, knowing Hebrew should be compulsory for all Palestinians. "They should teach it in schools because for the Palestinians, speaking Hebrew is more important than speaking English," she said. The Popular Committee Against the Wall and Settlements in Bil’in, near the central West Bank city of Ramallah, has reported that Israeli soldiers assaulted the weekly nonviolent protest wounding at least ten Palestinians, and kidnapped two. 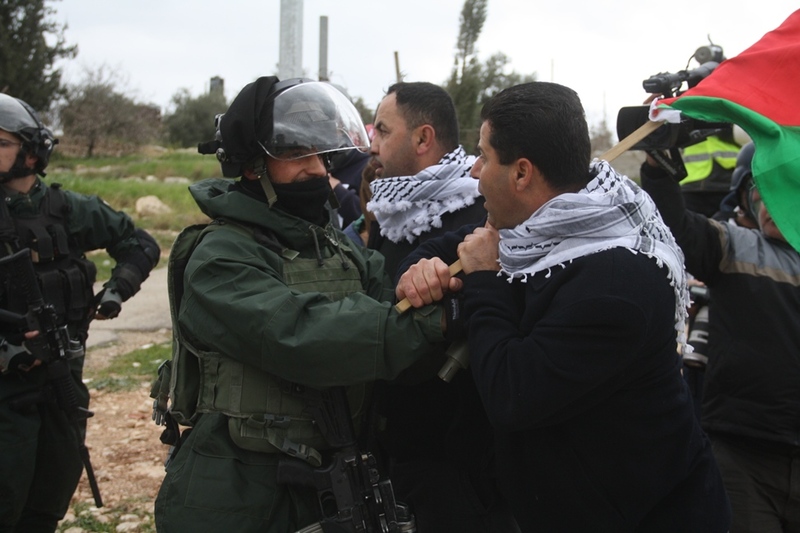 The Committee said the soldiers sprayed the protesters with gas wounding its deputy head Jamal al-Barghouthi, in addition to the head of the Popular Resistance Coordination Committee in Palestine, Monther ‘Amira, Abdullah ‘Oleyyan, Kifah Mansour, Mohammad al-Khatib, a photojournalist working for al-Hayat newspaper, Issam Rimawi, two Israeli peace activities, and two activists from Denmark and Holland. Soldiers also assaulted and kidnapped Mohammad al-Khatib, member of the Popular Committee, and an Irish activist, and took them to an unknown destination after violently cuffing and blindfolding them. The protest stated following noon prayers in the village, and the protesters marched carrying Palestinian flags, and pictures of Kayla Mueller, who was killed by ISIS in Syria. The protesters also carried pictures of Yusor Abu Salha and Razan Abu Salha, who were killed along with Deah Shaddy Barakat, who were all killed in North Carolina by Craig Stephen Hicks. They raised signs and chanted against terrorism in every part of the world, and for true justice, liberation, peace and equality. Coordinator of the Popular Committee Against the Wall and Settlement, Abdullah Abu Rahma, delivered a speech condemning the murder of innocent persons. Abu Rahma also stated that the Palestinians, their Israeli and international supporter, will continue their activities against the illegal Israeli occupation, and its colonies in Palestine, adding that next week’s protest, on February 20, will be marking 10 days since the beginning of popular resistance against the wall and settlements in Bil’in. The Federation of Arab Journalists (FAJ) said it supports the Palestinian Journalists Syndicate's decision to prosecute Israeli officials at international courts for committing war crimes against Palestinian journalists. In a statement, the Federation said that it had named its conference that was held from February 9 to 10 in the Moroccan city of Tangier "The martyrs of the Palestinian press," to honor the journalists who had been killed by the Israeli occupation. The statement expressed the Federation's solidarity with the Palestinian people and hailed their heroic steadfastness in the face of the Israeli occupation. "The Federation of Arab Journalists condemns the state terrorism which the Zionist occupation authorities are practicing against the Arab Palestinian people, who have become in dire need for international resolutions ending the occupation and its terrorism," the statement underscored. The Israeli Occupation Authority (IOA) on Wednesday renewed the detention of the Palestinian journalist Ala al-Titi from al-Aroub refugee camp to the north of al-Khalil. Local sources said the IOA renewed the detention of the Palestinian journalist for extra ten days over the charge of working for a “banned organization”, according to IOA. 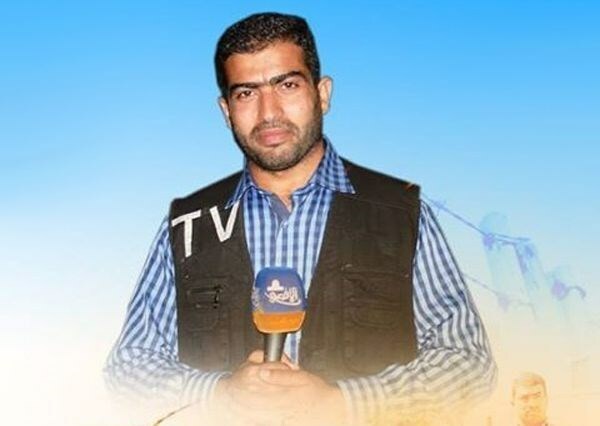 Journalist Ala al-Titi, who works as a correspondent for the al-Aqsa TV Channel, was arrested from his home in the camp on January 21, 2015. In the same context, the IOA arrested a few months ago the al-Aqsa Channel’s correspondent in Ramallah Mustafa al-Khawaja. He was held in the Maskobeh detention center for more than fifty days. A Jewish settler ran over a Palestinian journalist called Raed Abu Rmaileh at noon Sunday near al-Haram al-Ibrahimi Mosque in the Old City of al-Khalil. 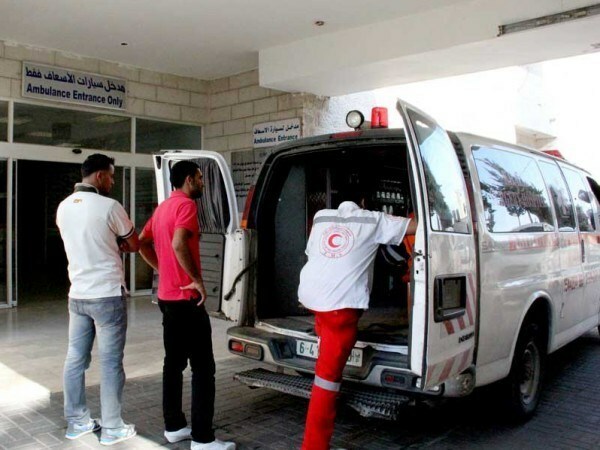 The PIC reporter said the journalist Abu Rmaileh was transferred to hospital by Palestinian Red Crescent ambulance for treatment in one of the city’s hospitals. Abu Rmaileh is a journalist from al-Khalil. He is working at B'Tselem human rights organization; he documents the Israeli crimes against Palestinians in al-Khalil, specially the Old City and the vicinity of al-Haram al-Ibrahimi Mosque. 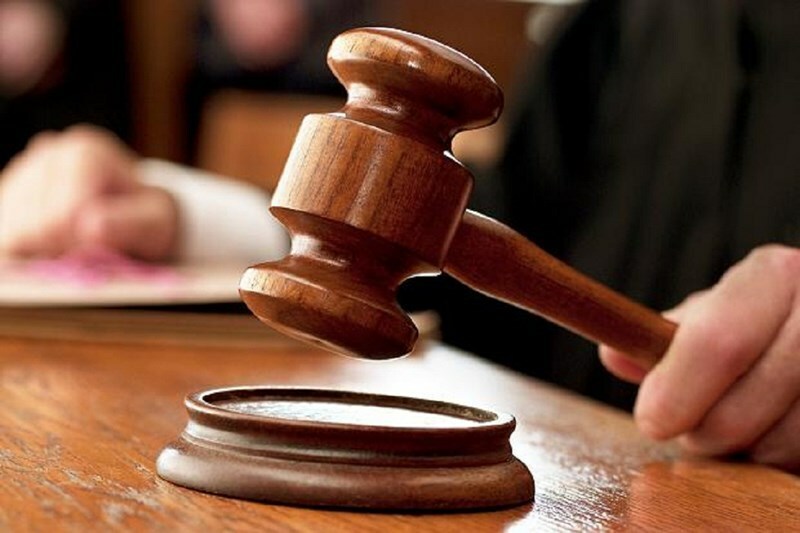 The Palestinian Authority court in Tulkarem afternoon Thursday cleared four Hamas-affiliated young men of charges about their intention to form an armed militia, after five years of court hearings. The acquitted Palestinians told the Palestinian Information Center (PIC) that The Tulkarem court decided to clear us of all charges filed by the preventive security apparatus after five years of adjournment. "45 hearings had been held over the past five years to reach a decision on the lawsuit, and that disrupted our study and jobs," they said. 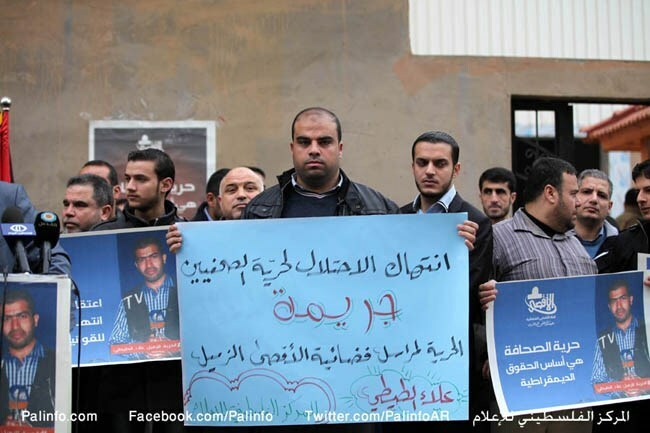 The released young men are journalist Yazid Khedr, Alaa al-Araj, Tarek Redwan, and Mohamed Salim. A mass rally, entitled “Journalists Are Equal,” was staged Monday by the Palestinian Media Forum in protest at the world’s double standards in reacting to crimes against journalists and freedom of speech. The rally-goers marched from the UN Square down to the UN Special Coordinator’s office, waving the Palestinian flag and lifting banners condemning the international silence regarding the crimes committed against Palestinian journalists. Head of the forum Imad al-Ifrinji said Palestinian journalist make use of the word, rather than the sword, to face up to the Israeli invader. “The world has never expressed solidarity with the Palestinian journalists who were killed and injured by Israeli bullets,” he added. He called on all international media and human rights organizations to stick up for Palestinian journalists and work on bringing the Israeli criminals to the International Criminal Court. Meanwhile, Khalil Abu Shamala, vice president of the Network of Palestinian non-Governmental Organizations (NGO), said the Israeli occupation forces killed a number of Palestinian journalists who posed no threat, just as was the case with the correspondent Fadel Shana’. “It is with the very zeal with which the Western community took to the streets in the wake of the Paris attack that the latter should voice solidarity with thousands of Palestinian journalists killed in Gaza and the occupied Palestinian territories,” he added. He said the Palestinian people have been subjected to Israeli state terrorism for decades and on a daily basis, yet nobody has acted in response. Abu Shamala reiterated Arabs’ and Muslims’ firm rejection of any affronts insulting the Prophet of Islam Muhammad, peace be upon him. Head of the Euro-Mediterranean Observatory for Human Rights, Rami Abdah, said none of the world’s journalists can be compared to the Palestinians who have been engaged in bloody battles against the Israeli colonizers. “Between the one who sacrificed their blood for the sake of freedom and the ones who stood safe in their own offices lies a difference, a very huge difference indeed,” he confirmed. Dhaher called on all international organizations to mobilize the world’s support for the right of Palestinian journalists and for the prosecution of the Israeli occupation terrorists.